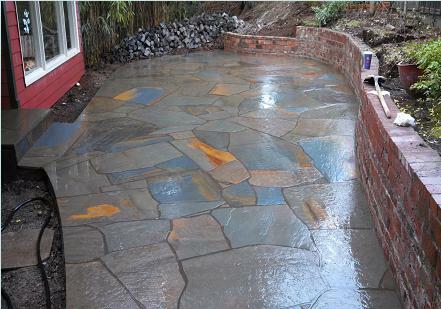 Here is the before and after picture of this new variegated bluestone patio. We removed the cobblestone and parts of the concrete strips that had broke . We then drilled into the old concrete and installed rebar to help tie into the new concrete base for the variegated bluestone patio. 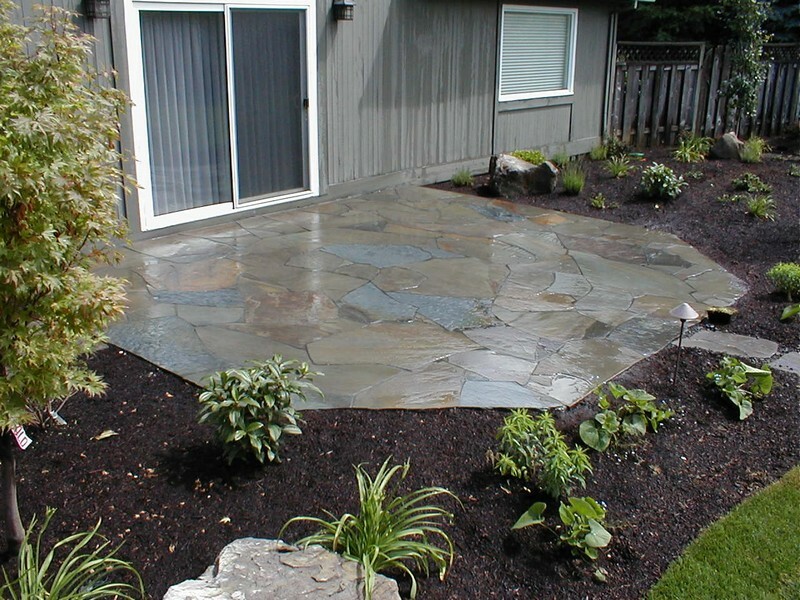 This stone had beautiful rust color in the stone that really set this Patio off, it is amazingly colorful with the blue and greens. we added a tint of black in the mortar to help set the color off but not so much it created an outline then removed the tile from the entry and used the old base to overlay in stone and the steps at the front gate were reused with a new walkway poured to the street edge and overlaid in the Variegated bluestone. We removed a brick staircase at the end of the patio and added the lower wall that can be used as a seating area and planting area behind it. we also rebuilt a small portion of brick wall at from walkway. 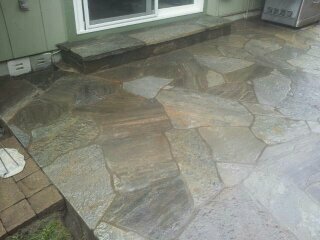 Here we excavated and installed the silver and gold mica premium flagstone patio with cut in joint work around granite boulders . 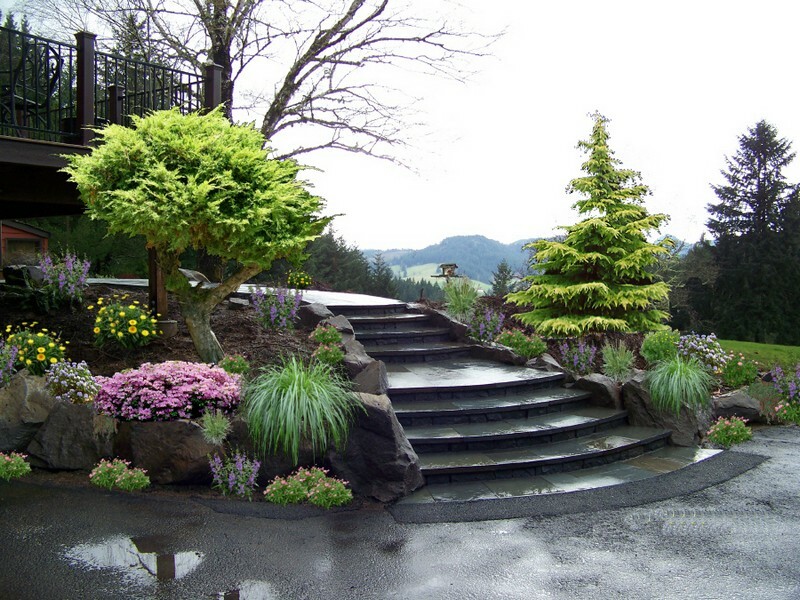 Flagstone from Clackamus landscape supply. 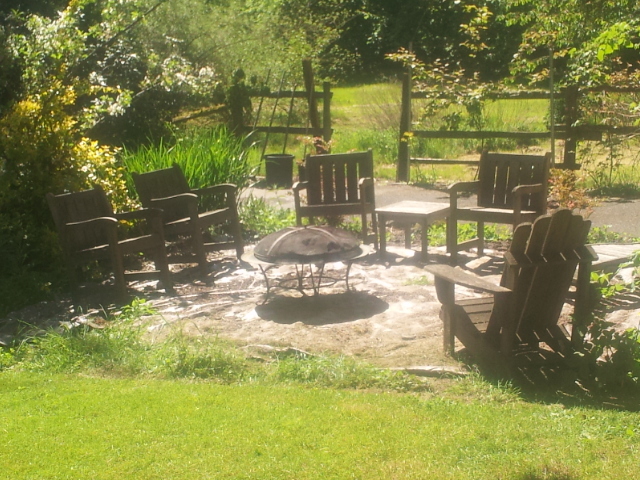 We took this small area and transformed it into a beautiful Brown trout flagstone patio. 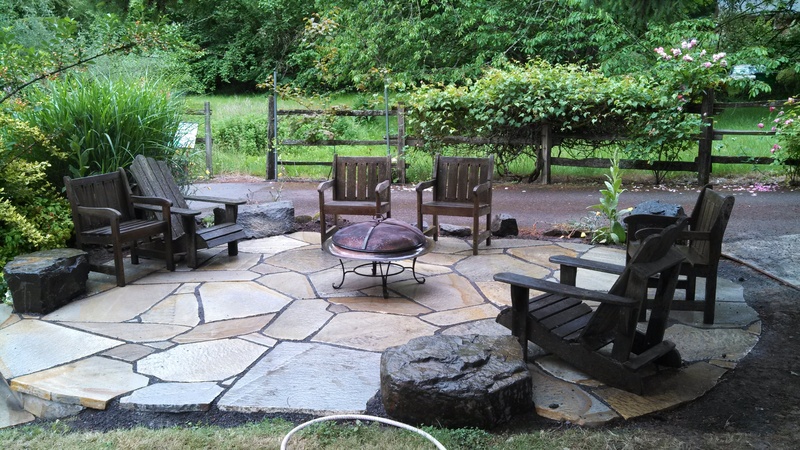 We used a premium stone from Clackamus landscape supply and trimmed the stone to keep the joint work looking good. we then sanded the joints with 1/4' minus . 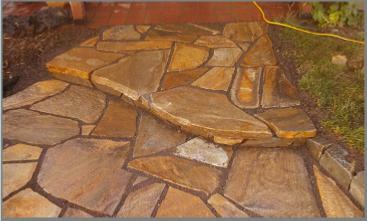 We then installed a small retainer wall of Montana wall stone that was a good match for the flagstone . Very nice and bright colors. Here we used the natural curve of the stone for the step. 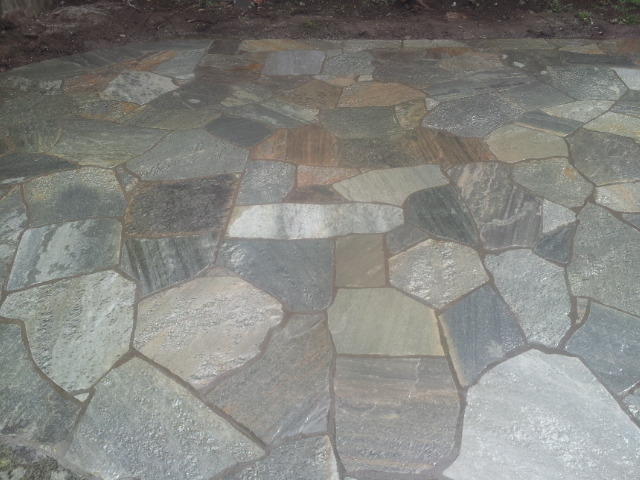 Here we designed a simple stone patio installing a mica slate patio with tight joints. we excavated and installed a rock base and poured the concrete base with fiber mesh to increase the strength of the base. 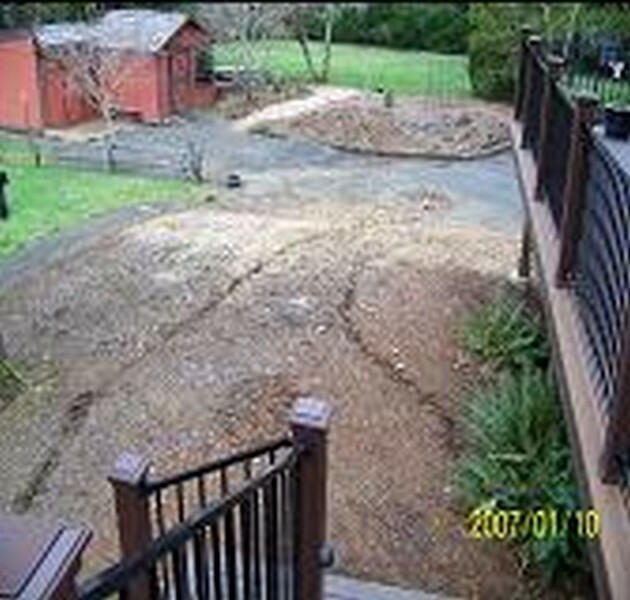 We also we able to reuse the old concrete step the customer had left from the old concrete patio.. Here are the before and after pictures. Here you can see the extra detail we use for the joint work, We try to keep our joints at 1/2"to 3/4" ,It is a slower process but the craftsmanship is much cleaner than a stone patio that has been slammed in without attention to the detail leaving 2 inch wide gaps that give it a unattractive look. 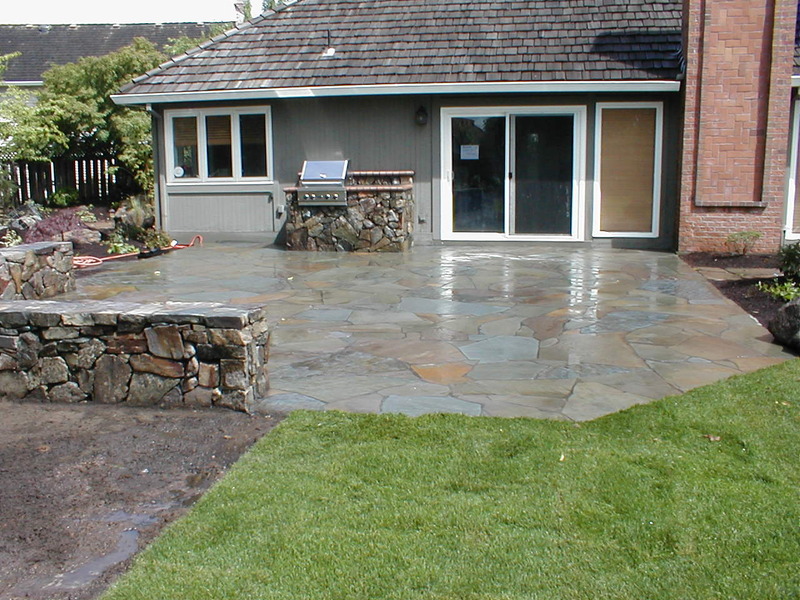 A Flagstone patio can be the most natural look you can have installed. 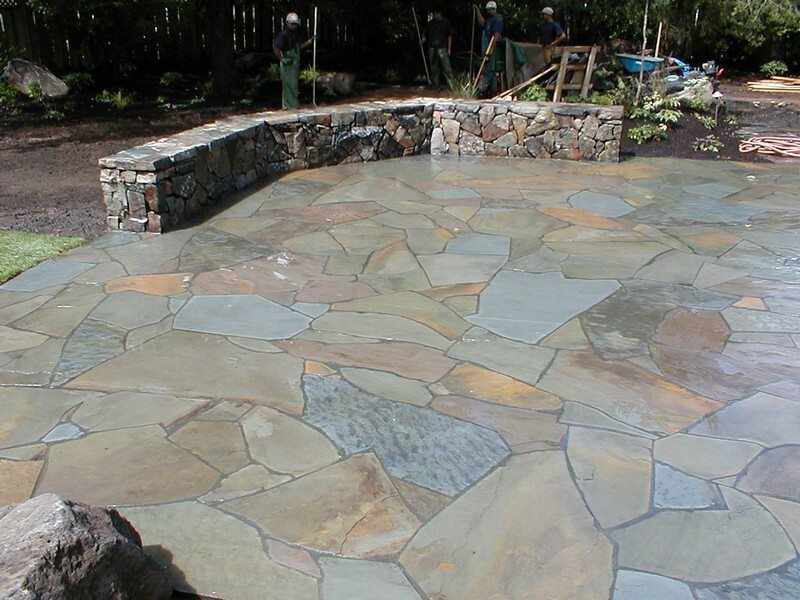 Randy McKee masonry installs all kinds of flagstone patios including bluestone, sandstone with integrating Boulder stone into the design to give it an even more natural look for your flagstone patio. Here is the final mock up with landscape done for the bluestone staircase giving the customer ideas on what the bluestone steps could look like finished. 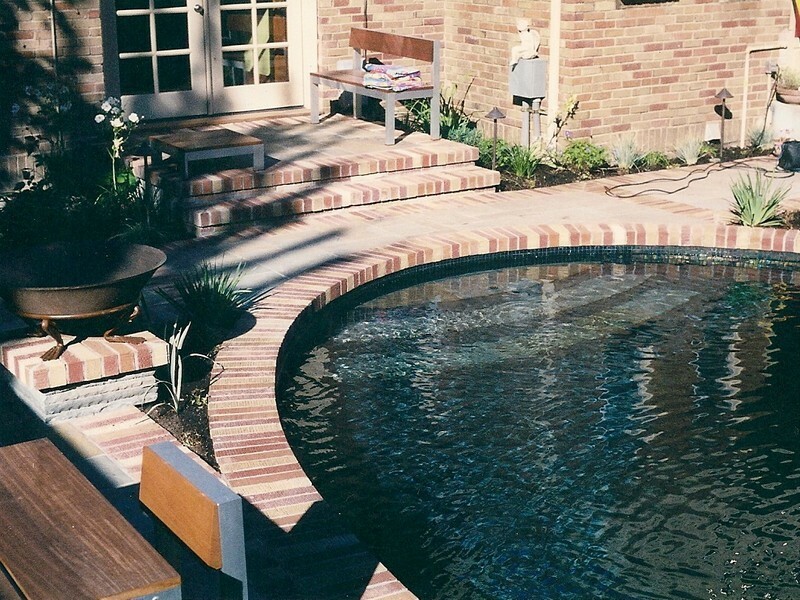 We did a few mock ups with sand set pavers and brick staircase and stone. On the left is the mock up and above is the final product, as you can see the stone staircase and stone patio area came out very close to the picture mock ups. 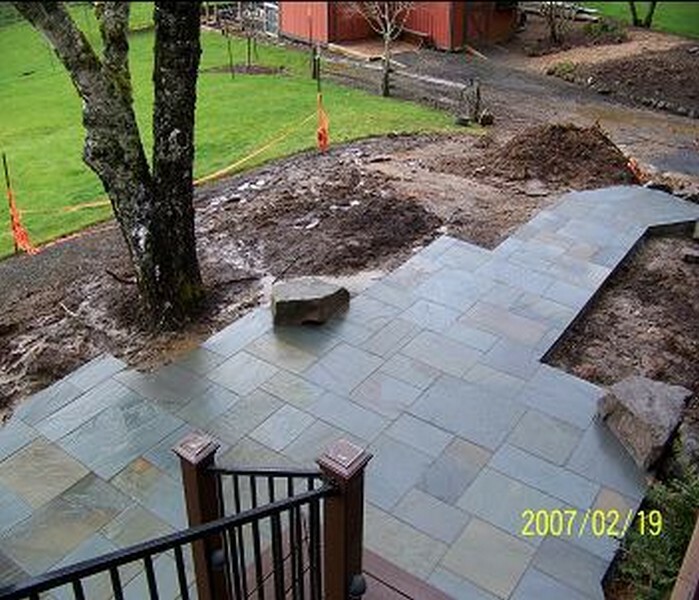 variegated blue stone patio with 1/2 inch joint work with a tight joint stack stone bench and BBQ, this was an existing patio that was extended .We then installed the bluestone over the entire patio. Please click on the pictures to enlarge them. 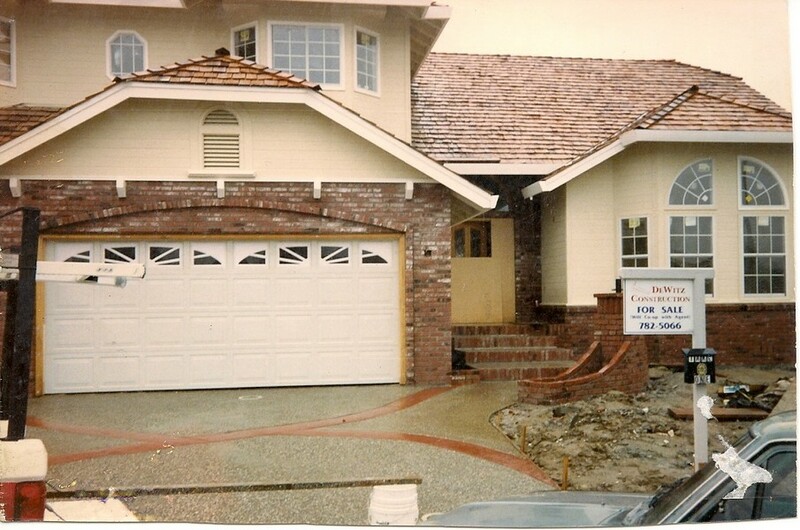 This flagstone entry was installed in a combination variegated blue stone and lavender stone that had been sealed with concrete sealer..the joint work was 2 to 3 inches and they used sand mix for mortar .We removed the old stone entry and installed true blue bluestone with medium ironspot versatile on the boarders. We rebuilt and integrated the new water feature into the old entry by cutting out the corner area and installing the new Bluestone with chiseled edging to give it a much more natural and unique look. 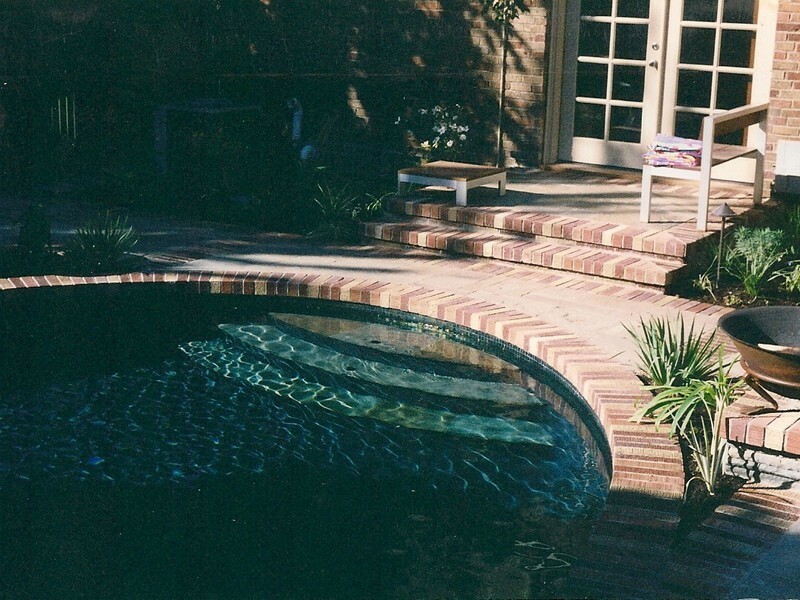 We installed the concrete base for the blue stone pool deck and patio area with brick inlay throughout the patio areas and around the pool rim with chisel edge blue stone stacks for the columns and step's inside the pool and spa area. Brick type was a tan rug brick. 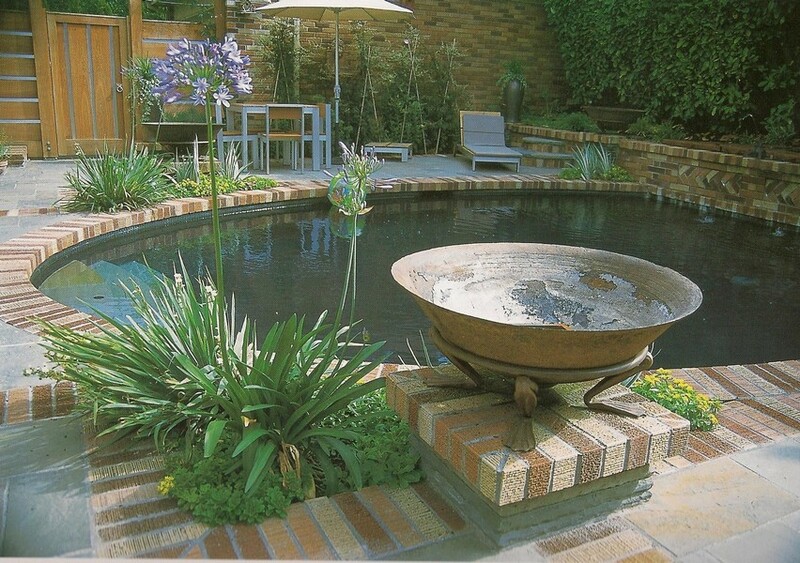 This project was published in Pools and Spas and was featured in the Oregon Home Magazine. 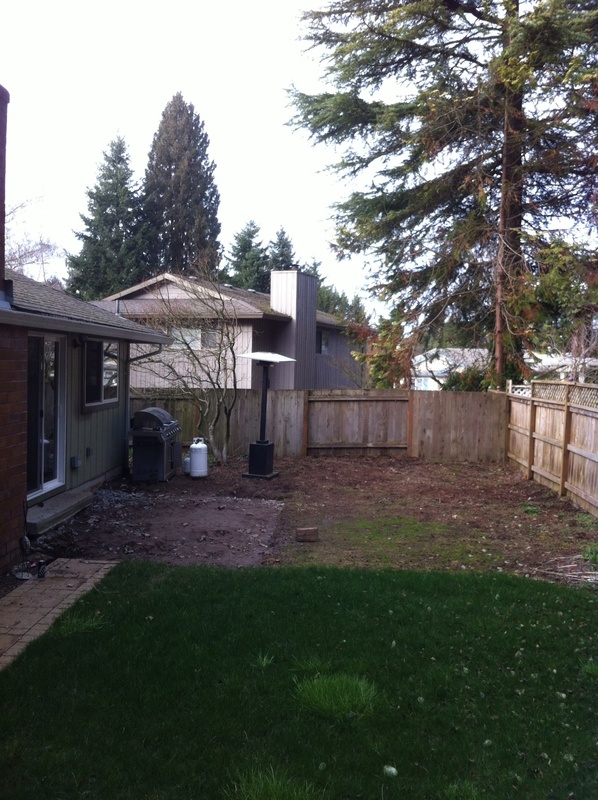 We took out a 5 year old cedar deck that was placed over a existing concrete patio. 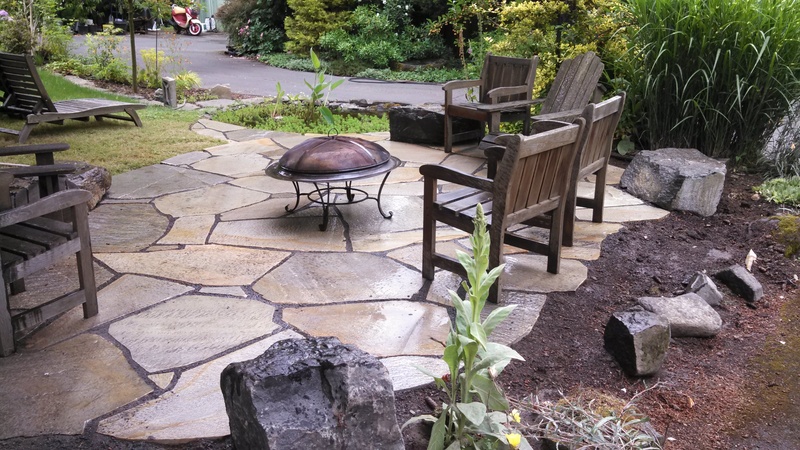 We extended and reshaped the old concrete patio and added a walk way to the back bedroom with a new flagstone patio area. 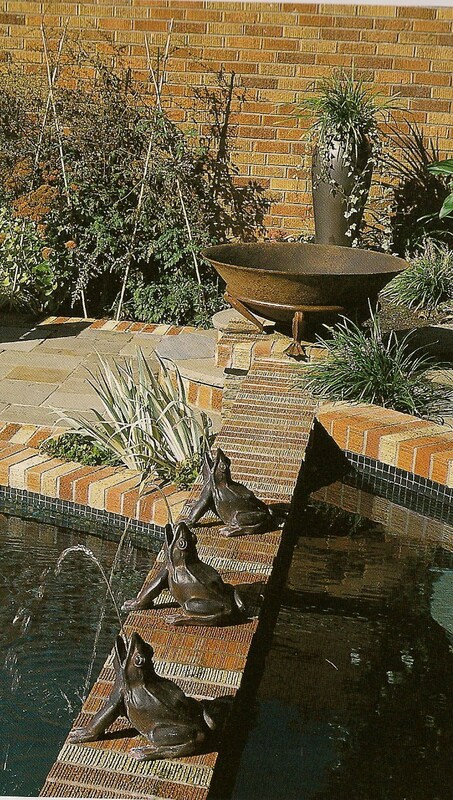 We used a pool coping edge and silver mica slate flagstone in the field area. 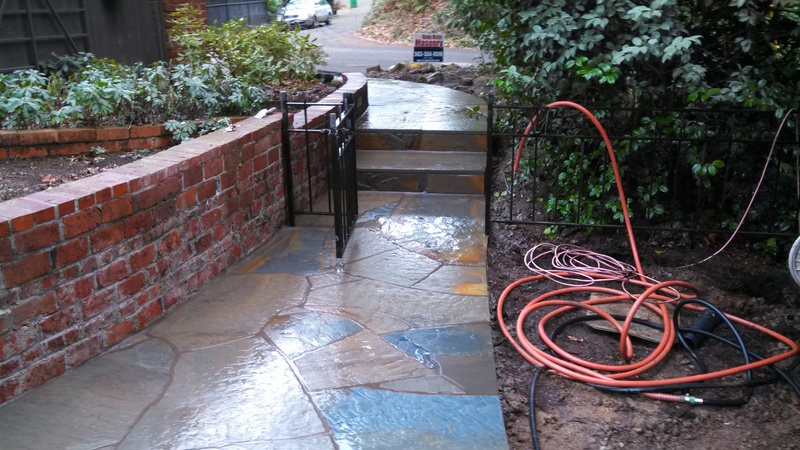 Here we installed a bluestone walkway and stone staircase from the street. 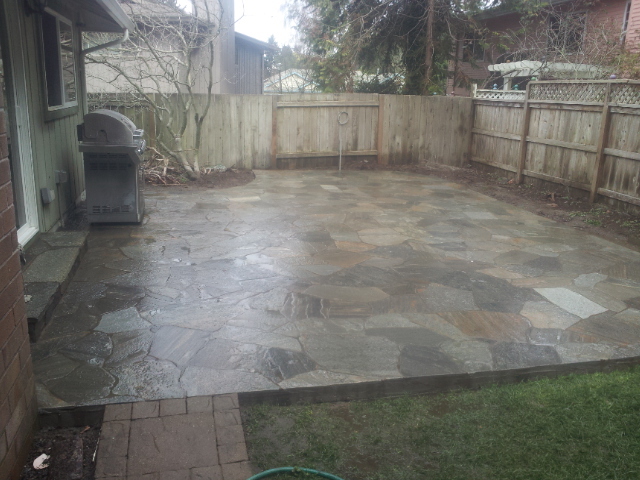 We removed an old concrete walkway and opened up the walkway at back door as the customer didnt want a patio area but just enough room to fit his BBq.